Within the boundaries of Richland Township are found two streams of water, namely: the east branch of the Nodaway River and Shanghai Creek. The former river flows through the northwest corner, entering on section 5, flowing through sections 6, 7, and 18, passing into Washington Township from the latter section. Shanghai Creek traverses the township from north to south through sections 1, 12, 14, 23, 22 and 27, leaving the township on section 34. There are also several small branches of these two streams. The land is mostly open and rolling prairie, the only timber of natural growth being on the banks of the Nodaway River. The first man to seek a home within the territory now embraced in Richland Township was John Gilman, who settled on section 5 in 1853 and erected for himself a cabin. Harvey Fortner settled at the same time as Gilman. The second settler of Richland was Joshua E. Chapman, who came in 1854 and entered land on section 5. In the spring of 1855 Thomas Ewing came. He was accompanied by James Ewing. Milton Chapman made a settlement in December, 1855. In company with his wife and five children he came all the way from Monroe County, with an ox team, traveling about sixteen miles a day. When they arrived at Twelve Mile Creek in Union County, it was some twenty-five miles across the open prairie without a house to be seen anywhere in all that distance. As the nights were bright with moonlight they left Twelve Mile Creek about 10 o'clock P. M. and traveled all night, reaching their destination about 3 o'clock in the afternoon of December 7th. Two days later there came a terrible snow storm and it was impossible for another person to cross the prairie that winter. As Mr. Chapman and family were not heard of again that winter, it was supposed that they had been lost in the snow storm and frozen to death on the prairie, and, in fact, was so reported in an Ottumwa paper. John Gilman built the first cabin in the township. He also broke the first ground and sowed the first grain. The first schoolhouse was constructed in 1858 and cost $400. The first birth in the township was that of a son to James and Margaret Ewing on April 13, 1857, and named Winfield S.
The first death in the township was that of a child of some emigrants passing through. The second death was that of Mary A. Ewing on August 19, 1860. The first religious services were of the Methodist Episcopal denomination. They were held in the house of T. M. Ewing in the summer of 1855. A cemetery was laid out in 1869 and was known as the Richland Cemetery. The cemetery in connection with the Union Church on section 15 was laid out March 3, 1871. The first interment was a child of A. H. Fisk. Hiram Fisk was the first adult buried there. In the summer of 1870 Fisk postoffice was established. George H. Walford was the postmaster. Richland Township was officially organized in 1860. At the fall election of that year the following officers were elected: James S. Ewing, justice of the peace; Benjamin Minert, supervisor. In 1872 an organization known as the Grange Lodge was effected at the McClure schoolhouse. It attained a membership of about thirty and flourished about ten years. The first officers of the society were: T. M. Ewing, master; D. J. Ely, secretary. The last secretary of the lodge was Alexander Evans. The Congregational Church of the Township was organized in 1881. The church building was erected in the summer of this year at a cost of $1,800. There was a cemetery laid out in connection with the church. Richland Union Church was organized in 1878 and during the summer a church was constructed. The first officers of the organization were: A. H. Fisk, president; H. H. Dant, secretary; Andrew Clayton, treasurer; T. M. Ewing, J. D. McClure, trustees. The Missionary Baptist Church of Richland Township was organized in 1871 with Reverend Johnson as pastor. Services were held at first in the Union Church. Thomas Ewing was another early settler of note who came in the days of the ox team, 1854, with his brother James, and settled in Richland Township. He served for several terms as county supervisor and was much interested in grange, alliance and temperance work. He was a soldier in the War of the Rebellion and was discharged for disabilities incurred in the campaign culminating in the battle of Shiloh. He died at Fontanelle in 1908. Rev. Joseph Mather was the first Congregational minister in the county. He came to Fontanelle and organized a church about 1858. He died at Fontanelle in 1862. Rev. J. W. Peet, a graduate of Middleburg College, Vermont, came to the county in 1864. He preached from Lincoln to Richland Township, riding the circuit and preaching in Lincoln, Grand River, Greenfield, Fontanelle, and Richland. He was instrumental in building churches at Fontanelle, the first in the county built in 1870, in Grand River and in Richland. He was county superintendent of schools for one term. After several years of service here he moved first to Prescott, Adams County, afterward to Monticello, Jones County, where he died in 1892. One of the first Congregational ministers in Adair County, under whom was erected the first church building in the county in Fontanelle. George R. Peet early developed a large farm near Nevin in Adair County; later purchased and conducted a lumber yard in Prescott, Adams County. Upon the location of the Creston and Northern Railroad he purchased the first lot sold in Orient and opened the lumber business which he carried on in connection with his Prescott business and farm operations. He afterwards traded his Adair property for a hardware business in Monticello, Jones County. He later moved to Alden, Hardin County, where he died in 1893. Henry and Hyram Fisk early settled in section 16, Richland Township, and near one corner of that section laid out the first cemetery in the township. Hyram died in Adair County and Henry moved West, serving several years as sheriff in Oregon, where he now resides, enjoying the title of Judge. John Coolbaugh settled on a farm which he named Penn Avenue, from his native state. His brother, William, was a prominent banker at Burlington and Chicago and owner of a large amount of Adair County land. John Coolbaugh looked after the estate, together with his own business. He gave the Penn Avenue Cemetery to the county and largely contributed to the building of the Penn Avenue Church. John Coolbaugh died at the home of his son, Prof. Melville Coolbaugh, in South Dakota and was buried in Penn Avenue Cemetery. Homer Brooks, whose ancestry traces directly to Jonathan Brooks who landed from the Mayflower on Plymouth Rock, and whose wife, Mary Kellogg, was a lineal descendant of Governor William Bradford, also of the Pilgrim band and the second governor of the colony, settled on land which he had owned some years in Richland Township and developed a new farm in 1879. Mr. Brooks' grandfather was a soldier in the patriot army through the Revolutionary war, afterward settling on the frontier in Ohio, from which state Homer Brooks and family came to Adair County. Mr. Brooks lived on his farm until 1890, when he moved to Greenfield, there dying in 1905. Mr. Brooks was active in grange and alliance work, was a prominent member of the Methodist Episcopal Church, and was at one time candidate from Adair County for the Senate, and always a man of strong convictions, ripe judgment, and unblemished integrity. Another prominent early settler of Richland Township was T. C. Heacock, of Quaker ancestry, from Ohio, who with his wife, Rachel Mather, also of Quaker extraction, settled in Adair County. Mr. Heacock was for many years prominent in political life; strong in grange, alliance and farmers' institute work; vice president and director of the Farmers Mutual Insurance Company; and always a progressive man in every effort to better the condition of society. He moved some years since to Harper County, Kan., and there has followed the same lines of activity as he did in Adair County. An early settler on the south side of Richland was George W. Grant, who came to Iowa from Maine about 1857. He had quite a local reputation as a poet and created some good verses. He died several years ago. L. J. Gray settled in Richland Township in 1868 and farmed for two or three years, but having lost an arm in the Civil war, he was unable to conduct the business with the vigor necessary to the greatest success. He removed to Fontanelle in 1873 and entered the contest as republican candidate for county treasurer and the same year was elected. During his term, there being no bank in Adair County, he was obliged to keep the county funds in a bank at Des Moines. The failure of B. F. Allen's bank in that city in 1874 left the county treasurer out about five thousand dollars, which was an entire loss to the county. Mr. Gray served two terms as treasurer and was afterwards engaged in the real estate business in Greenfield with W. B. Martin and later moved to Chicago, where he died some years ago. William W. Peet, son of Rev. J. W. Peet, also of Richland, was a young school teacher, and deputy treasurer in the office of L. J. Gray for about a year; then he secured a position with the Burlington Railroad as land and tax clerk in the office of the superintendent, a position which he held for several years, being advanced to a very responsible position in the business of that road. About 1886 he accepted the position of financial agent for the American Board of Commissioners for Foreign Missions at Constantinople, Turkey, a place of vast business responsibility, which he still holds. Rev. 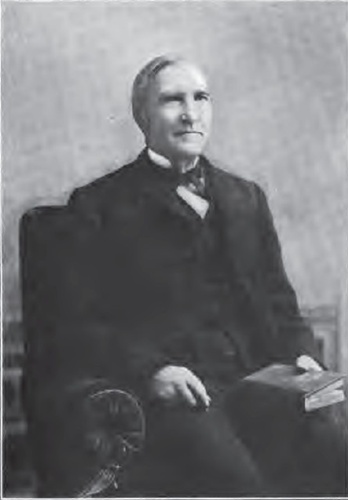 Josiah W. Peet, a graduate of Middlebury College, Vt., and a Congregational minister, was one of the early ministers in the county and was instrumental in building the first church in the county at Fontanelle. He purchased and improved a farm in the south part of Richland Township, was pastor of the churches in Richland, Fontanelle and and Grand River and preached occasionally in Lincoln and other townships in the county. He served one term as county superintendent of schools and took great interest in educational development. In those times the preacher's work was mostly a labor of love; the pecuniary consideration being hardly enough to supply a living for himself, let alone his family. The calls for help and consolation took him on long horseback trips over lonely trails, and over flooded streams; a hard, dangerous and devoted existence which dwellers of the present generation can scarcely comprehend. An example of the land shark is given in the history of the Town of Nevin, a portion of which lies in the south part of Richland Township. Long before the days of the railroad in Iowa, about 1855, some speculators came out to Iowa from Massachusetts and located a large tract of land in Adams and Adair counties. They contemplated platting it into house lots about the center, surrounded by two and a half, ten acre, forty acre and one hundred and sixty acre lots, and showing on the plat a city some four miles square, with parks, churches, streets, etc., in embryo. There was a small creek, dry a considerable part of the year, which runs to the Nodaway, some miles distant. The promoters went back East and showed their fancy map of a city of magnificent distances, located at the head of steam navigation on the Nodaway River, and succeeded in disposing of some of the land. A colony of settlers, lured by high promises, came on the long journey by railroad and stage, and from the Mississippi River by steam, to find in the place of a thriving town, an unbroken wilderness. A few who were too poor to go farther stuck and in time, as travel began to cross the prairies of Iowa, and conditions of settlement improved, they succeeded in developing a fine little town, always hoping for a promised railroad which never came, executing the New England grit which built states. It is related in the Ellis History of Nevin that the first party of colonists wandered around for several days before they could find out where Nevin was located, and that the first year or two the privations and discouragements were such as were almost beyond the range of possibility.